SensorTec’s high quality sensors for the plastics, packaging and rubber industries provide an economical means of temperature sensing and are available in several standard thermocouple and RTD configurations. Sensor styles shown in this catalog section represent some of the standard constructions available. We have several other styles, sheath sizes and materials, leadwire types and thread sizes available. We also manufacture retrofit sensors for European equipment and offer a complete selection of metric sheath sizes and thread types. Contact our Technical Assistance Team for aid in selecting a sensor for your specific requirement. All sheaths and tips are constructed from 316 stainless steel for superior resistance to corrosion, abrasion and deterioration. All sensor junctions are GTAW (TIG) or plasma welded. Brazing or silver soldering of sensor junction is not utilized due to the potential for flux contamination or deterioration. 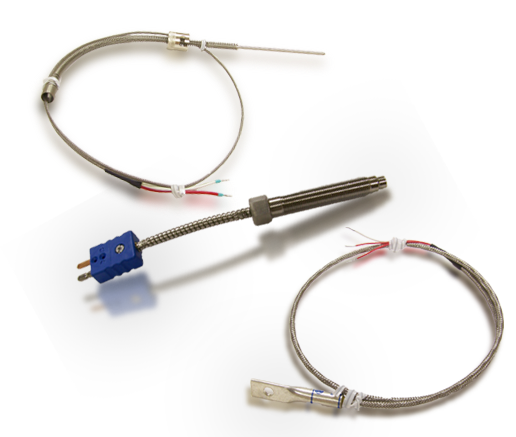 RTD’s shown in this section are available in two different temperature ranges and leadwire types, the “L” Series and the “M” series. Corresponding specifications are listed on each page for the two different RTD ranges. All sheaths and tips are constructed from 316 stainless steel for superior resistance to corrosion, abrasion and deterioration. For specific information regarding RTD elements specification and standards, wiring configurations and color coding, see the RTD general information section of this catalog.